Sometimes amazing things come in old boxes. Unfortunately, those old boxes are not usually archival to best preserve the items inside. As I have been re-housing some of our older collections, I have come across so many amazing things and want to share them with you! This summer our volunteers in the archaeology lab helped the staff process artifacts owned by the U.S. Fish and Wildlife Service. This involved repackaging artifacts in archival materials, cataloging and labeling artifacts, and archiving paper records and photos. These collections are from sites in North Dakota located on federal U.S. Fish and Wildlife lands. Some of the pottery sherds in the U.S. Fish and Wildlife collection from Sargent County are net impressed. This means that the potter used a net to finish the outer surface of the vessel. If you look closely, you can see impressions of the knots and diamond-shape pattern made by cords on the sherds. This is not something we see every day, so it was very exciting when Fern Swenson, our division director (and a ceramicist) confirmed that these were indeed impressed with a net! 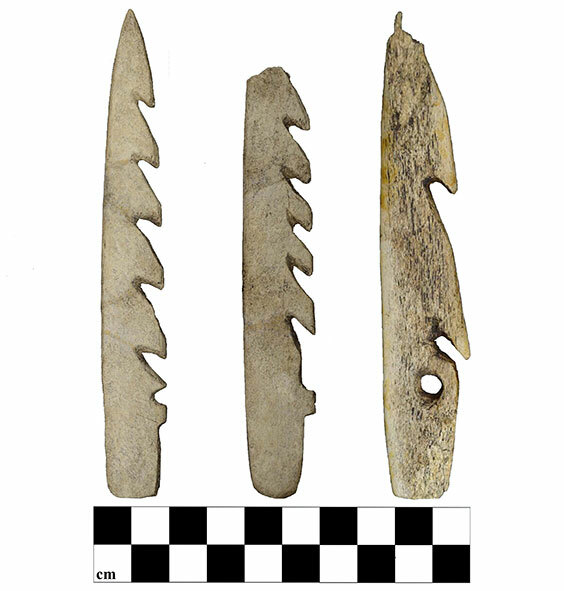 We also cataloged two barbed fishing spears from the Irvin Nelson site (32BE208) near Devils Lake in Benson County. These are likely made out of bison bone and are the first that I have seen. 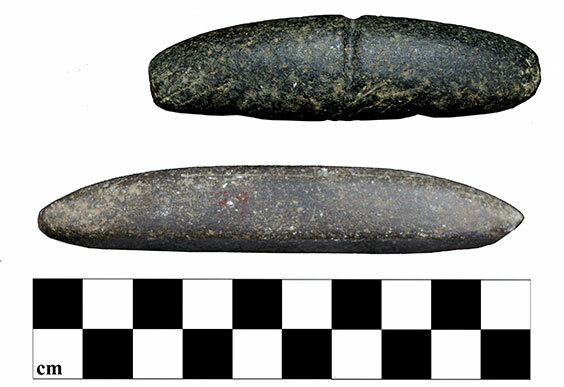 But as I would find out a few weeks later, these aren’t the only fishing spear tips in North Dakota’s archaeology collections. While going through a box that was part of an older, privately donated collection, I was excited to find another bone fishing spear tip! This tip is from a site in Burleigh County. 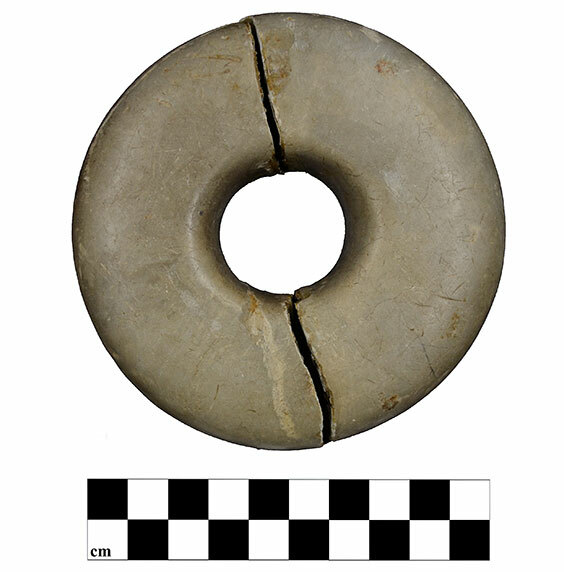 Another item in the same box worth mentioning is a tchung-kee stone made out of a rock that has been pecked and ground into a smooth doughnut shape. It was broken in half at some point in the past, but the pieces still refit together. These stones were used to play a competitive game of skill. You can see artist George Catlin’s 1832 painting of Mandan people playing tchung-kee at americanart.si.edu/artwork/tchung-kee-mandan-game-played-ring-and-pole-4407. 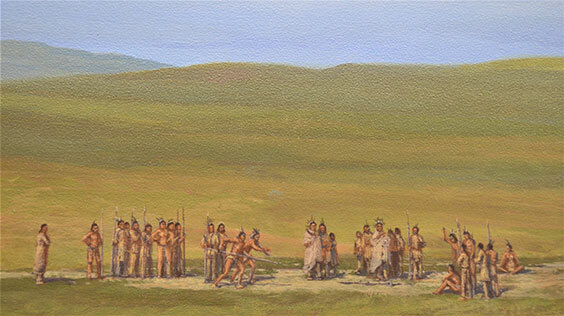 The next time you visit the North Dakota Heritage Center & Museum, take a look at a scene based on Catlin’s painting in the cyclorama of Double Ditch village in the Innovation: Early Peoples Gallery. Speaking of Double Ditch, I also came across two unique artifacts from that site. 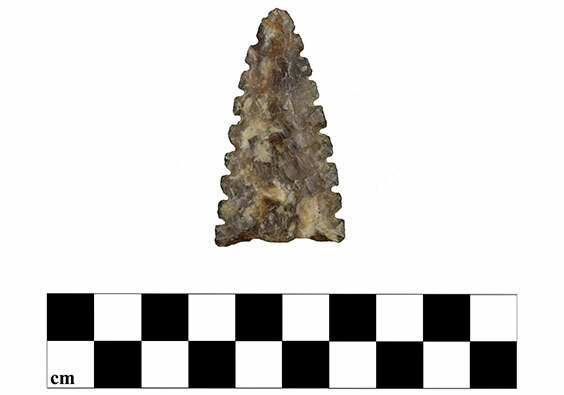 This projectile point with notched edges is very thin and skillfully made. 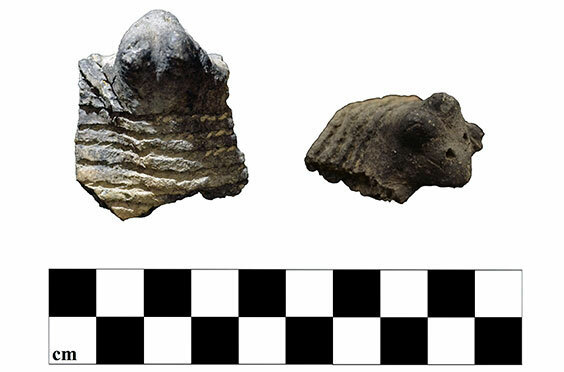 Another artifact is this ceramic effigy node—an animal-shaped piece of clay that was part of a pottery rim. The rim sherd is also cord-impressed--a cord or thin rope was pressed into the wet clay to make a pattern or design. 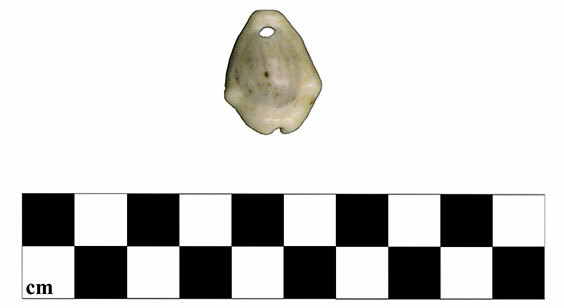 The last old box that I inventoried contained a shell pendant. North Dakota’s Chief Archaeologist Paul Picha identified it as a “money cowrie” shell (Monetaria moneta), which likely came from Africa. These were used as trade goods during the 18th century fur trade. This week has been the week of atlatl weights (and that is not something most archaeologists get to say). In the same collection as the shell pendant, I found an atlatl weight. These are beautifully made, but not very common– they usually trump anything else on our “Find of the Day” board in the lab. 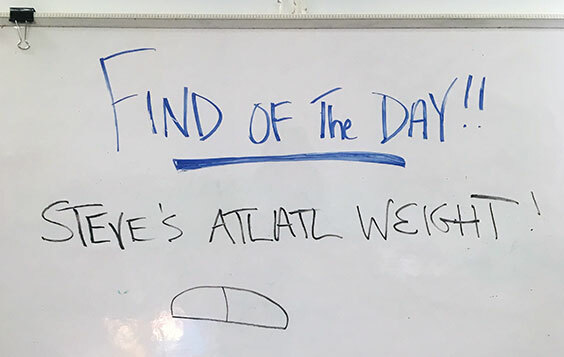 Yesterday, a volunteer who is helping re-house a privately donated collection found the second atlatl weight of that week. 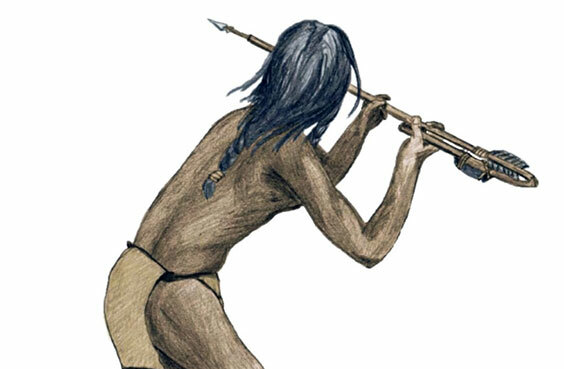 Atlatls were used to launch darts in North Dakota before the bow and arrow--from Paleoindian times through the Woodland Period. Weights were attached to atlatls to provide additional stability and balance. We have hundreds of boxes to re-house over the next few years, so I will share more with you from my expeditions to our collections storage rooms!